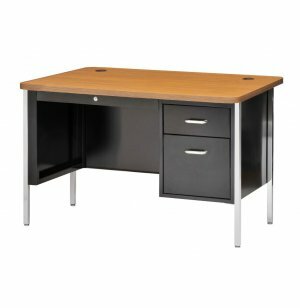 Single Pedestal Metal Teachers Desk 48"x30"
This medium size teacher's desk measures 48 inches wide by 30 inches deep. This model is designed with a single pedestal with standard box (letter) and file drawers. Both are lockable for security. The smaller size makes this perfect where space constraints are a concern, yet the single pedestal design means that this teacher's desk has more legroom than double pedestal desks. With the large volume drawers, desk storage should not be a problem. 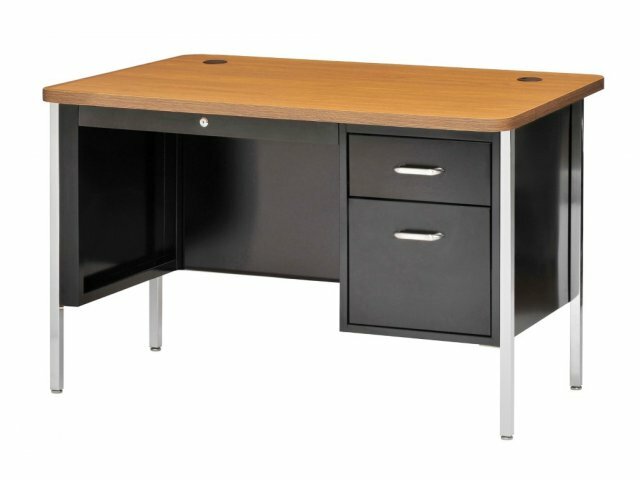 Designed with rounded corners for safety and a tough, scratch resistant laminate top makes these desks easy to clean and virtually maintenance free. Heavy-duty, steel construction means that this desk will continue to be a classroom staple year after year. Even when yesterday's kindergarten class has graduated high school, this dependable teacher's desk will be providing years of service to the classroom. Desktop features a 6" rear overhang for easy student-teacher conferencing. Two wire management grommets in desktop and in each side for easy wire management. Full-extension file-drawers with steel ball-bearing slide suspension. High-sided file drawers accepts hanging folders.